DETROIT -- A Smart dealership in an upscale Detroit suburb will close next week, and the minicars will be sold out of the nearby Mercedes-Benz of Bloomfield Hills dealership. A letter to customers attributed the closure to Mercedes' February move to take over sales of Smart. Previously, Penske Automotive Group had been running the dealer network. "Starting July 1st, Mercedes-Benz of Bloomfield Hills will be representing the Smart brand in the metro Detroit market," the Smart dealership's general manager, Shane Reed, wrote in the letter to customers. Reed could not be immediately reached for comment today. Penske launched the European microcar brand, owned by Mercedes' parent, Daimler AG, as an independent distributor in 2008. But after a fast start, U.S. sales of the tiny, French-built ForTwo have plummeted, according to Automotive News. Penske got off to a roaring start with Smart, selling 24,622 cars in 2008, as gasoline prices reached record highs. But sales have tumbled in the past two years -- falling 59 percent in 2010 to 5,927. This year, ForTwo U.S. sales plunged to 2,226 through May – down another 20 percent from the same period last year. 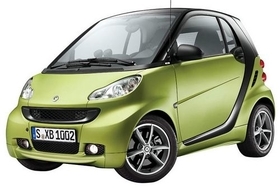 Under the deal announced in February, Smart's distribution rights and management shifted to Mercedes-Benz USA. Of the 79 dealerships that had been selling Smart cars, 21 lacked Mercedes products and were set to lose the Smart franchise. Mercedes now plans on having about 100 dealerships selling Smart cars in the United States this summer. Penske is buying back equipment and tooling from terminated dealerships. Penske will continue to train and offer technical support to Smart dealers this summer because Mercedes has yet to set up that part of the business. The Bloomfield Hills dealership to be closed is a standalone location. Penske Automotive could not be reached for comment this afternoon for information about what happens next at the dealership. Charles Ghesquiere Jr., owner of Mercedes-Benz of Bloomfield Hills, said his dealership, at 36600 Woodward Ave., has enough room to accommodate Smart. "This would be difficult if we had to build another facility," he said. "We have a perfect area for this, and it's going to work nicely." Ghesquiere said that after July 1, both his dealership and Mercedes will be marketing the Smart cars extensively. "There's going to be a lot to say about this," he said.